For the roof, we decided on GAF Timberline HD (Hi Def) Weathered Wood Shingles. We used this shingle on the entire house except for the roof of the wrap-around front porch. We went with a metal roof for the front porch which we purchased through Lowes. The metal porch roof is Union Advantage-Lok, gauge 26, lifetime paint grade (Union Corrugating manufactures the metal roof and supplies it to Lowes). I highly recommend the Timberline HD shingles and the Union Corrugating metal roof; both are high quality products. I discussed options and obtained quotes from several local roofing companies; more than I would like to admit. However, it was well worth the time. The roofing quotes, and often questionable advice from the roofers, was all over the place. The more time I spent with roofers the more I realized I needed to educate myself first. We were considering options that included a metal roof for the entire house, at first, and/or shingles; or a combination of both. After evaluating cost and ROI down the road, we went with the combo. There were 2-3 local suppliers for the shingles; Home Depot won the bid with the best quote. They delivered the shingles and we hired a local roofing company to install them. The local roofers charged a flat-fee per square. 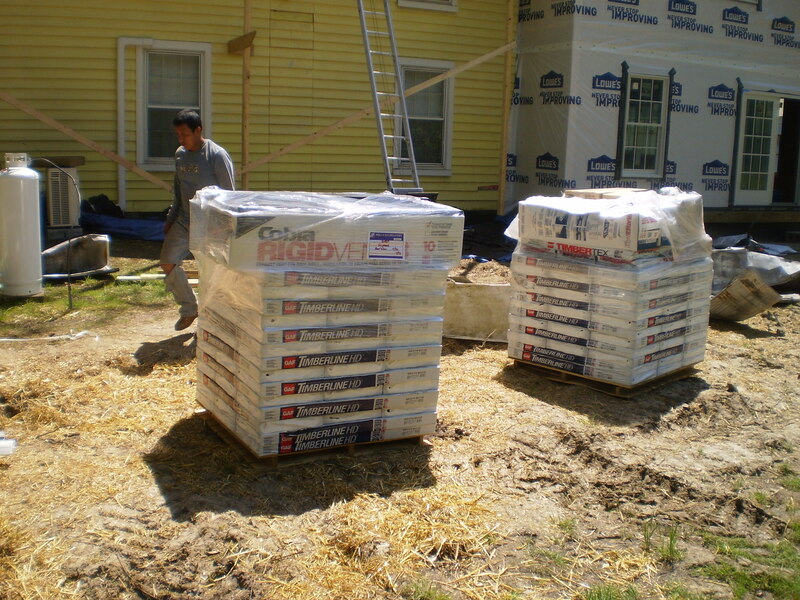 In our area (RVA), the installation rate is around $100 per square (one square is 100 sq. ft.) plus an additional cost for replacing/installing plywood sheets. Since we removed an old metal roof from the existing portion of our home we needed to install new plywood sheathing. The old farmhouse portion of the roof includes new plywood sheathing. We also added a “continuous ridge-vent” to the existing portion of the home as well as a continuous ridge-vent to the new addition. Underneath the shingles we used Tiger Paw™ Roof Deck Protection (also called roofing felt or underlayment). It does cost more but it is a superior product worth considering for a long-lasting roof.